Jose Flores was accompanied by two of his children, both born in the U.S.
Scott Walker was confronted by a family of an undocumented worker in his childhood hometown of Plainfield, Iowa during one of the final stops of his whirlwind presidential campaign launch tour on Sunday. Jose Flores, an undocumented immigrant who calls Wisconsin home, was accompanied by his 13-year-old daughter Leslie and 7-year-old son Luis, both of whom were born in the United States and naturalized citizens. “Why are you trying to break my family apart?” 13-year-old Leslie Flores asked, confronting Walker as he approached the family and addressed Leslie’s father directly. Shaking Flores' hand, Walker said he “completely sympathize[s] with the situation you’re all in and others are in” but explained his position for not supporting deferred action. 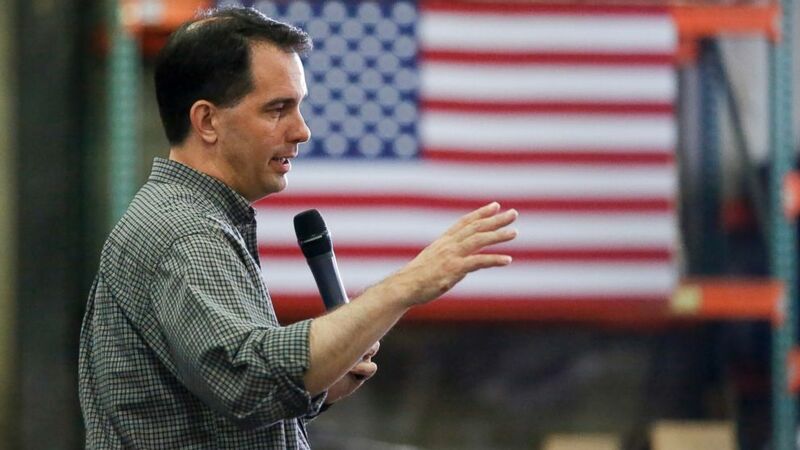 (Mike Burley/Telegraph Herald/AP Photo) Republican presidential candidate Wisconsin Gov. Scott Walker addresses a crowd at Giese Manufacturing, July 19, 2015, in Dubuque, Iowa. The Flores family lives in Waukesha, Wisconsin – Walker is their governor – but made the trip to Plainfield under the sponsorship of a Wisconsin immigrant rights advocacy group, Voices de la Frontera, which paid for their transportation, to confront the newly-minted Republican presidential candidate on the campaign trail. “Do you want me to come home and come from school and my dad get reported?” Luis asked Walker, presumably meaning to say deported and not reported. Flores said both he and his wife would both be eligible for deferred status under the executive actions President Obama took to grant certain undocumented immigrants temporary legal status to live in the United States without fear of deportation. Walker is among a bloc of governors who have signed onto a lawsuit against the Obama administration on the issue. Flores asked Walker directly if he would consider dropping his support for the lawsuit. But Walker said he would not. “I support the lawsuit because I believe the president can’t be above the law,” he said. Since launching his campaign, Walker has said that he first wants to secure the border before determining what should be done with the millions of undocumented workers currently in the U.S. without proper documentation but has also said that he does not support a pathway to citizenship for those here illegally. From the crowd of reporters and onlookers clustered around Walker and the family, a woman shouted out to ask if Walker would deport families who would qualify for deferred action until the law is changed. Despite his opposition to deferred action, Walker said he would not deport those families. After a several minutes long exchange, Walker excused himself from the confrontation to return to mingling with members of the Plainfield community who had come out with their lawn chairs to welcome him back to the small town, where his father served as the pastor in a Baptist church for seven years. From Plainfield, the family moved to Delavan, Wisconsin when Walker was 10. The Flores family walked away from the interaction disappointed, the children in tears. Leslie explained that her little brother’s greatest fear is to come home from school and find that one of their parents has been deported. And for her, Leslie said her passion stems from the experience of a close friend whose father was deported back to Mexico. “That really affected her and by her telling me her story of how her dad was deported, it was really heartbreaking for me,” she said. “To see how much he hates immigrant families is too much for me, that's why I came here to just tell him, ‘Why is he separating our family?’” Leslie asked.